This is a scarf I'm working on at the moment, using handmade wooden knitting needles by Doug Peake from Evergreen Woodwork in Sandspit, BC. 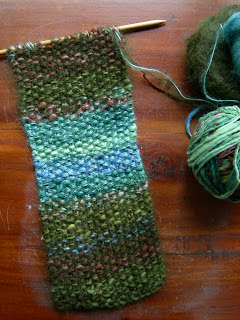 I chose to work this scarf in a moss stitch, inspired by the colours of the yarn. I love the moss stitch, it has a very unique feel and it looks like it's a woven piece. The yarn I'm using comes from hobbledehoy.etsy.com, and is a very soft merino blend, which I'm combining with green and blue mohair yarns as I go.